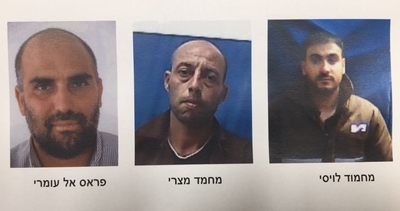 The recent arrests of several Islamic Movement members for plotting terror attacks against Israeli soldiers show that the group continues to operate despite being outlawed two years ago. According to the Shin Bet intelligence agency, Israeli-Arab citizens plotted to attack IDF soldiers in the southern Negev region as revenge for the 2015 banning of the Northern Branch of the Islamic Movement. Three members of the ring are in custody. Two, named by the Shin Bet as Be'ersheva resident Muhammad Masri and Abdullah Iash, from the southern Bedouin town of Kasaifa, were arrested in December and are on trial now. As the trials progressed, investigators continued to learn new details about the plot, leading to the arrest of a third suspect, Mahmoud Luisi, from Qalansuwa, in central Israel. Luisi was arrested in March when he returned from Turkey. A fourth suspect, Fares Al-Umri, who is a senior member of the Northern Branch of the Islamic Movement, was also later arrested. Al-Umri "is the person the members of the cell turned to, in order to receive approval for carrying out the attack," the Shin Bet said. He has long been the subject of attention by Israeli security forces. He ran a charity, "Joseph the Righteous One," which claimed to care for incarcerated security prisoners. The charity was subsequently banned by Israel. According to the Shin Bet, Al-Umri also worked as a security guard for Islamic Movement Northern Branch leader Raed Salah. The plot originated in November 2015, when Masri and Luisi arrived at a tent, set up in Umm El Fahm – where the Islamic Movement's Northern Branch was based – to protest Israel's decision to ban it. Explaining their decision at the time, Israeli authorities described the Northern Branch as "the sister movement of Hamas." The movement's Southern Branch split off in 1996 after choosing to participate in Israeli politics, sending elected representatives to the Knesset. It remains legal. Created in 1971, the Islamic Movement grew into a powerful force that challenged secular nationalist ideologies among Israeli Arabs. Salah, the movement leader, has been repeatedly arrested and convicted for incitement. He completed a nine-month prison sentence in January. At the 2015 protest tent, Masri and Luisi spoke with Al-Umri. Originally, they discussed spray painting graffiti against the ban, but that grew into a plan to conduct a terror attack inside Israel, the Shin Bet said. The emerging cell members allegedly divided up tasks of identifying a target, obtaining an unregistered car, surveilling the target and getting a gun. Al-Umri gave the cell a Palestinian produced sub-machine gun last year, the investigation found. He also allegedly sent them electronic remote controls that could be used for setting off explosives. In October, Al-Umri met in Turkey with senior Hamas operative, Majd Abu Katish, who was released by Israel in the 2011 prisoner exchange for abducted IDF soldier Gilad Schalit. Al-Umri asked for money and guidance on plotting the attack, the intelligence agency said. Two other Israeli Arabs, from the northern Galilee region, are under arrest for arms trafficking in a manner linked to the plot. "The Northern Branch of the Islamic Movement has, for years, been closely affiliated with Hamas. This investigation underlines that common ideological basis, and deep ties between operatives from the two organizations, and the great security risks posed by this," a Shin Bet statement said. It also noted a "shift by operatives in the Islamic Movement, who went from apparent humanitarian activity to terrorist activities." Before being outlawed, the Islamic Movement's Northern Branch worked hard to indoctrinate Israeli Arabs through outreach efforts called "da'wa." Since the 1990s, Israel shut down numerous charities that acted as front groups for the organization. In the run-up to the start of the Second Palestinian Intifada, the Islamic Movement also led efforts to build a large underground mosque on the Temple Mount site in Jerusalem. It frequently issued rallying calls to "defend" Jerusalem and the Al-Aqsa Mosque against fabricated Israeli plots, while offering a radical narrative designed to demonize Israel using Islamist rhetoric. Israeli authorities deliberated banning the Northern Branch for years, weighing the move against allowing it to operate in the open, and keeping it under close surveillance. When the Israeli attorney general's office made the move in 2015, the Movement was described as a significant threat to Israel national security because of its incitement to violence and ties with Hamas. "These organizations are secretly and actively cooperating with one another. The northern branch is a separatist, racist organization that doesn't recognize the State of Israel and its institutions, rejects its right to exist, and calls for the formation of an Islamic caliphate," a statement by Israeli Attorney General Yehuda Weinstein said. The shooting plot isn't the only security investigation into the activities of the banned movement. A joint investigation carried out in recent months by the Shin Bet and the Israel Police's Unit for International Investigations led to the arrest of six members of the Islamic Movement's Northern Branch. The suspects include senior operative Suleiman Agbariya, who served as the movement's acting manager. The suspects, most of them from Umm El-Fahm, including Agbariya, allegedly acted to "safeguard and continue the Islamic Movement's activities, with an emphasis on activities in Jerusalem, despite being outlawed," the Shin Bet said. They set up a charity and attempted to hide its ties to the Islamic Movement. An additional 20 suspects were questioned during the course of the investigation, including the charity's founder, a man from northern Israel. The Shin Bet identified Agbariya as "the dominant element in promoting the illegal activity." He allegedly oversaw what other members did, and instructed them on channeling funds towards the charity. Cash-filled sealed envelopes flowed into the charity, and over 200,000 shekels were seized in the investigation. The Shin Bet said some of the suspects pocketed "significant sums" for personal profit as well. It appears as if clandestine attempts to threaten Israel's national security by members of the Northern Branch will continue. Israeli security agencies have vowed to remain on alert for future plots, and to pounce when they detect further attempts to revive the outlawed movement.